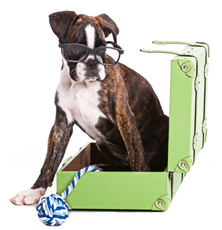 Air Animal offers pet customs clearance at all major gateways for pets moving into the U.S. and pets returning to the U.S. from abroad. Pre-import document review, messenger services, destination airline handling and any necessary veterinary inspections are included in the $395 fee. Personal representatives from Air Animal meet pets arriving through Tampa or Orlando. Need a pet delivered? We deliver arriving pets to residences, veterinary practices or boarding kennels for an additional charge. Ask one of our Air Animal pet movers about this expanded service option.